Last episode we gave you 7 ways to cut or reduce fat in a recipe, and today we are going to finish off the topic of how to reduce FAT in a recipe. We have 12 more ways you can cut fat and improve the nutrition in your recipe! Remember that this is a guide, not a rule, so if you want rules, please go back to episode #3: on the 7 rules to recipe makeovers. This will give you in understanding the goals of recipe improvement and how far you can take improving a recipe. So let’s get into our tips! Full-fat cream cheese: If a recipe calls for this ingredient you can use a fat-free or low-fat cream cheese, or use low-fat cottage cheese pureed until smooth. Just use your food processor or blender to do so. This swap will work great in recipes like ones for dips and spreads. I am thinking of my sister in laws favorite dish to bring to family gatherings is called Surprise Spread. It is a mix of salsa, sour cream, cream cheese, cocktail sauce and cheese. You would absolutely be able to use low fat cream cheese in this recipe. Full-fat sour cream: Use fat-free or low-fat sour cream, 2% or fat free cottage cheese, part-skim ricotta or fat free plain yogurt. Our favourite in my household is to use the Kirkland brand of Greek yogurt instead of full fat sour cream. When we have a treat meal like farmer sausage and perogies, I spoon out the Greek yogurt into a bowl and take that to the table and no one notices! It is virtually fat free, and has a super thick consistency. The issue with low fat sour cream is that it is significantly thinner than full fat, so in some cases it can be a noticeable swap. But in something like surprise spread, you wouldn’t notice it at all. In baking, you can substitute full-fat sour cream for low fat yogurt or buttermilk. Other tricks for swapping out full-fat sour cream when making dips, is use mashed beans (white, black, kidney, chickpeas) instead of sour cream. This is a really simple and easy swap. The basic rule of thumb is that you can swap out the same amount, no reducing or changing measurements. This is definitely the case when you’re using it uncooked, like for dips, salad dressings, or baked potatoes. The key is to remember that yogurt is tangier than sour cream, and you might have to adjust some of the other ingredients accordingly. We don’t recommend using nonfat yogurts for recipe swaps. Nonfat yogurts may have added thickeners and stabilizers, plus a chalky flavor, which really makes it very different from sour cream. If you are heating up or simmering yogurt, like in a soup recipe be careful to not heat up the recipe too high. Yogurt has less fat than sour cream, so you have to watch out when using it in sauces. Keep the temperature low to prevent it from curdling, or just add the yogurt at the very end after you have turned the heat off. Full-fat buttermilk: You can use low fat buttermilk or yogurt; or place 1 tablespoon lemon juice or vinegar in a one cup measure and fill with enough skim milk or 1% milk to make 1 cup. Mayonnaise:  Use reduced-calorie mayonnaise type salad dressing or reduced-calorie, reduced-fat mayonnaise; or, replace ½ or all of the regular mayonnaise in a recipe with low-fat yogurt or low-fat sour cream. Oil-based marinades: Reduce the oil by up to ½ and increase other ingredients like wine, balsamic vinegar, fruit juice or fat-free broth. *sometimes just water will be o.k to as it will keep the acidity level down. Salad dressings: Try fat-free or reduced-calorie commercial dressing or make your own with:  mild vinegars like raspberry, rice wine or sherry; be generous with fresh herbs and spices  orange juice, buttermilk or yogurt to replace some of the oil. Whole milk: Use skim milk, 1% milk, evaporated skim milk or plain low-fat calcium fortified soy beverage. Cereal Cream: Use 2% milk, low fat evaporated milk or low-fat sour cream. Whipping Cream: Use a small amount of non-fat whipped topping or cream. Substitute vegetarian ground round for part or all of the ground beef meat for stew. Trim visible fat; brown in a non-stick skillet; substitute ¼- 1/3 of the meat with an equal weight of extra vegetables – Andrea likes to use ‘riced’ carrots (carrots chopped up in a food processor like rice grains), or canned rinsed and drained lentils! Hot topic question: Is butter a good substitute for coconut oil? Andrea and Susan say no. There isn’t enough scientific evidence to prove that coconut oil is better for your health over butter. Enjoy both butter or coconut oil in moderation. We hope you enjoyed this episode! 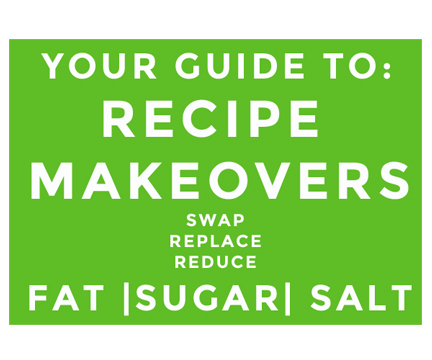 Make sure to get your full RECIPE MAKEOVER GUIDE! *Source: Some of our content today has been inspired by the Dietitians of Canada PEN hand out Recipe Makeovers.